Craig Hartley is a high-intensity trainer and the owner of Potential, a high intensity training gym in Yorkshire, UK (Facebook). He’s also the author of Potential: The Keys to Unlocking Your Genetic Potential. Craig’s expertise is in using high intensity strength training and tailored nutrition plans to help his clients build muscle and burn fat to prepare for bodybuilding contents, improve health and well-being. 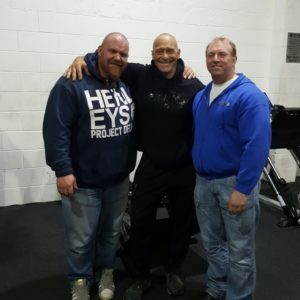 In this episode, we discuss Craig’s staggering muscle gain over decades of training, his high-intensity workout routines (in immense detail), and how overtraining almost cost him his life. Please note, I recorded this episode long before my episode with Dr Doug McGuff on “bulking up”. If you’re a regular listener you will notice that my thinking may seem out of sequence. Brandon Jonker – Does Repetition Duration Matter? What Craig explained about driving through the positive makes sense. I myself do this, probably a bit different, too. This is IMO also what the intend should be at the point of deep fatigue with max. effort. Its all effort based, the efort recruits the amount of fibers needed (with the firing rate needed). I do the initial first 40 seconds(about) slowly by intention and i fatigue sets in increasingly I apply this drive through idea. At some point of max effort the resistance moves at a slow enough speed and despite staying at max effort and motor drive the speed decreases dramatically. Also like Craig, no swinging starts. To control this all the mental energy and attention goes into what I’m doing……..so no distractions allowed. Not to forget, I liked the podcast. Luke Carlson also spoke about the ” intent ” to drive through those last few reps as well trying to move quickly although you probably won’t be able to because of fatigue . One of the best i’ve heard yet ! Excellent ! I totally agree with much of what Craig said including the part about the positive aspect of the exercise . I’ve found that very slow positives are not very productive in that they seem to put a lot of stress on the joints & connective tissue . As a matter of fact i actually didn’t use positives in my training for a long time and just used negatives & statics . I saw the positive as quite frankly a waste of time and actually presents the most danger in terms of for example the bottom of a press , and coming out of that position very slow where the body is in the most vulnerable position isn’t good . Driving through the positive is a good way to describe what i’m currently doing on push-ups and by driving i mean 2 seconds or so to the top . And the contraction & burn in the muscles is excruciating ! While not everyone who advocates HIT training is dogmatic there does indeed exist this attitude among some that you ” must ” do this and you ” must ” do that . The primary determinate with respect to good results is always going to be EFFORT despite the particular variables involved . I’ve also seen first hand that many don’t train nearly as hard as they presume they do . As far as number of exercises per session i couldn’t agree more with the statement that many exercises can’t be performed per workout if done with high effort . I personally find it’s not possible for me to perform more than two perhaps three exercises per session and give true justice to each movement , with the third movement and to some degree the second suffering to some extent . Same here! And that has come to such point with time too. Hey guys Awesome episode. Cheers Craig&Lawrence, I very much enjoyed your conversation! On the topic of the positive part of the repetition, I think I hear what Craig is saying and it seems to me I have an explanation. There are two points. For one, the positive part of the repetition is The most energy challenging one. For similar TUT, say 60 seconds TF, things will look Very different in terms of feeling and respectively follow up recovery if one’d do different ratios of rep speeds e.g. 3 reps total, but 10/10 vs. 5/15 vs 15/5…the medium one being the easiest on the system. In this sense, the statics, even in the hardest point of ROM are still going to be the easiest on the system (even very very hard to the muscles). So if Craig or anyone is more of a “system fatiguing” guy, or one has become more such with time (bult size and strenght), I can see how the duration of a posistive part of the Rep would mattter a lot. Second point is, that moving deliberatly very slow, relies on achieving fatigue in order to recruit maxumum amount of muscle fibers. So that fatigue model, has a potential drawback. Since we reqruit muscle via our nervous system and that process is very much dependent on CV fatigue as well (as a lot of other things are dependent on personal CV capacity and fatigue treshold), it may be the case for a good number of people to end up not stimulating a lot of fibers in the end of a long set, despite reaching Failure (inability to continue in proper form). And Lawrence, on your notion about your gilfriend reaching failure, I’d like to say from my personal experience, women rarely are able to push themselves hard. Their perception of effort seems to be on the very low end in general. The only practical method of pushing them and teachig them what they should look for in a workout has been training in Max Pyramid style for some time :))) That kind of does it I’ve found. I may have missed this, but did Craig mention what his typical TUL is for any particular exercise… or a rep range?! It is good that he was able to recover from his serious health issue. But it is hard to learn much from his experience since the causes seem unknown. I can understand, though, why he might have gravitated toward abbreviated routines, just given the impact of that his heart issues might have had on work capacity and endurance. Regarding his weight and size: He says that when he competed in bodybuilding, he was 225 at 5’10”. You suggested that, as a bodybuilder, he must have been less than 10% body fat. Just for fun, I plugged those numbers into an online calculator, and got a Fat Free Mass Index of 29. Now for some perspective: an ‘average’ male has a FFMI around 19; the upper limit for natural trainees is thought to be about 25. Some have argued that a few genetic freaks can get to 26 or 27 naturally. 29 is well into the range that can only be reached by genetic freaks using steroids. Now I am not saying he is a steroid user. I accept his denial at face value. But I am suggesting that something about those numbers is off, they are just too good. Regarding his observations of seeing people train in other styles and not having much progress to show for it: isn’t that pretty much true of any kind of strength training, even HIT based? Dramatic gains, if they are going to happen, will happen in the first year. After that, you are into the plateau of greatly diminished returns. About training to failure: Arthur Jones was famous for saying that you haven’t trained intensely if you haven’t thrown up after a set of barbell curls. This never made much sense to me: the biceps are just not that big. If you properly focused your effort on the target muscles, why would such a small amount of muscle mass be able to produce so much systemic stress that you would get nauseous? Leg presses, squats, deadlift: sure. Bicep curls??? So do you need to feel like your head is about to blow off to know that you trained intensely enough? That seems like an exaggeration, one that perhaps suggests insufficient focus on the real purpose of the exercise. For me, if I use enough weight, it is fairly obvious when I’ve reached a fatigue level where movement can no longer be sustained. I also know how to cheat, break form, involve other muscles in order to sustain movement beyond that point. But that seems to violate the spirit of the HIT approach. I agreed that moving arbitrarily slow at the beginning of a set isn’t that important, since you are just using those reps to fatigue the muscles. I find it much easier to move in a smooth, controlled manner (don’t throw the weight, just squeeze it up) and let my speed slow down organically as I weaken the muscles to the point that movement stops. Interesting that he uses mostly standard gym equipment; aside from the Nautilus pullover, I didn’t hear any fancy machines or exercises mentioned. Instead, it was free weights, smith machine, cable machines, etc. Perhaps it all comes down to differences in neuromuscular efficiency. I think that with barbell curls you’re contracting so much more than just the biceps in order to coordinate/stabilize the bar that it can sometimes , if pushing very hard can make you feel a bit nauseous . I’ve experienced that on an ARX machine, doing biceps curls. And in that case it was not because of stabilization issues, as you are not holding actual weight and balance is not an issue at all. Simply doing a few max reps (the machine resists you perfectly matching your whatever strength 100 % throughout the complete ROM), really taxes you out big time. If you are not careful, you can easily overwhelm yourself and eventually feel dizzy… doing biceps curls. How does someone that nearly died not actually know what their heart condition actually was. “My heart was like a carrier bag”? Tbh with greatest respect I thought the same re Greg Anderson’s vague diagnosis a couple of episodes back. Let’s all be thankful that Mr Hartley survived his heart ailment . All kinds of things befall people and science/medicine simply cannot explain them . There’s much that is still unknown about the human body and we have to accept that although that doesn’t mean we know nothing and will never learn anymore . Great stuff! With over four decades of Heavy Duty/HIT under my (well worn) belt, I can say with 100% conviction it works! Where it fails for the masses is they don’t work for it. The two main culprits I have seen are: 1) there’s failure then there’s FAILURE! Many shortchange themselves about what they are truly capable of getting out of a set. 2) There’s no cookie-cutter Heavy Duty routine. Mike NEVER claimed that! Heavy Duty was a dynamic, ever evolving entity. Mike provided an ideology, as a critical thinker, in the hopes others would individualise them to their personal needs. That’s where the lazy wants someone else to do the thinking for them, then blames Mike’s or his ideas for “not working” for them. Hey Lifter, thank you for your comment. I completely agree that HIT or any resistance training performed to momentary muscular failure will yield the same results, and the best results. Yes, training to failure can be difficult depending on one’s mental toughness and exercise selection e.g. try doing wall-sits to MMF vs a MedX Leg Press, very different difficulty level. Interesting point, regarding Mike’s Heavy Duty. Makes sense to me!